Although an exact dates of Homer's life are hard to establish, Herodatus places his life around 850 BCE. He wrote of the use of arrows poisoned with venom in the epic tale of The Odyssey and The Iliad. The Greek toxikon is arrow poison. 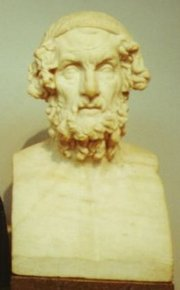 The formative influence played by the Homeric epics in shaping Greek culture was widely recognized, and Homer was described as the teacher of Greece. Homer's works, which are about fifty percent speeches, provided models in persuasive speaking and writing that were emulated throughout the ancient and medieval Greek worlds. Fragments of Homer account for nearly half of all identifiable Greek literary Papyrus finds. Homer's influence upon toxicology rests upon his writings that mentioned tokkicon, or arrow poison. It is important to realize that Homer wrote what could be considered to some degree history, or what the ancient Greeks would have called history. Thus, the mentioning is noteworthy because it speaks to a larger use of poisoned arrows in wars around Homer's life. Despite the vast literary collections of the ancient Greek play writes, little is known about who Homer actually was because the name Homer was attributed to the works rather than the man Homer taking credit for them. Some speculate that Homer was a blind man born in any number of Ionian cities while still others claim the literary giant was merely a nom de plume for one or many of a group of oral storytellers. The latter contention is derived from linguistic considerations. The Greek word homeros means "hostage" and those contending it is impossible to know exactly who Homer was point out that he most likely was a aberration created by the poet society Homeridae. His two most famous works, The Iliad and The Odyssey, have such striking differences that most contend that the two were actually written by more than one author. Despite the obvious uncertainty surrounding the authorship of the epics, Homer (whoever he or they were) has had an immense influence upon all levels of scholarship. From history to english and linguistics, the work of the poet is timeless. One cannot undertake a study of anything ancient without somehow crossing Homer's path.